Posted 5/26/2011 10:03pm by Miranda Combs. 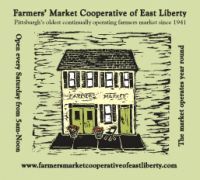 It should be a great holiday weekend and rest assured the market will be open and ready to serve your holiday needs. We will have lots of locally grown items. So please make the market part of your Memorial Day Holiday weekend! Please stop by the Zang, Kistaco and Greenawalt booths. And of course the Kennedy's will have meat. We received some new locally made cheeses this week and will have them at the market this Saturday. Please click on the link to check it out.